We are having egg issues! We currently own 17 laying hens. Let me repeat that… we own 17 egg laying hens and yesterday when we collected eggs, there was 1. How do 17 chickens who are only a year or two old only produce one egg? Our numbers normally drop in the winter, but they have never dropped this bad, over the last week we have collected just over two dozen eggs. That is 24 eggs in a week. We should be getting at least a dozen a day! I am perplexed. Normally, we sell at least 5 dozen eggs a week. That is really helpful in covering the cost of the addition chickens, that we raise specifically for egg sales. It would be really great to get egg production back. During the winter chickens do not produce as many eggs because their bodies are using those calories to stay warm. We have been increasing their feed and supplementing feed with extra compost and pumpkins that we have collected. They are enjoying the extra treats but they are still not producing. They are running low on crushed shells so I will get more of that today. I also have been occasionally giving them sunflower seeds as scratch grains, I will increase that as well as add some cracked corn to their diet. We will be also adding lights to our chicken coop. I will put a light in the night coop where they sleep and in the covered area where they can get out of the rain. We have had some really rainy, over cast day and I am wondering if they are not getting the light that they need. I hate to force them to lay, I know that their bodies need a break, but this is a little extreme. The decrease in egg production as been going on for about 2 1/2 months. We have still been able to get at least 5 dozen to be able to sell. This week I had to tell my last regular egg customer that I did not have any eggs for them. I do not want to lose them, if they think that they are not going to be able to get eggs from me they will go somewhere else. Since we have been talking about chickens and eggs so much around here the last couple of weeks, we have been trying to figure out what the plan is for our flock in the New Year. We know that over the course of the year we will be raising 48 chickens for meat. We are going to do it in two batches, the first in yearly March and the second in July. We have learned in the past that is not a good idea to raise chickens near hunting season, there is no one to help process them. We are also going to be at least adding an addition 6 to our flock. I would love to get 2 dozen eggs a day. That would cover what I want to sell as well as I want to make our own mayo from now on. I hope everyone had a wonderful Christmas and I wish you and your family a Happy New Year. I am very happy to announce that I have finally tattooed a rabbit. If you have been following my blog you will see that I have really struggled with tattoos. I mean that it has become something that has haunted me. I sell rabbits never knowing if the tattoo was actually going to work. I am very grateful that everyone I have sold to has been very understanding of my deficiencies. I have purchased multiple tattooing tools, still no luck. Finally, I changed ink and eureka I have a tattoo. I purchased Speed Ball India Ink Super Black from amazon. Another rabbit breeder suggested it to me. I am so thankful that it worked. I know it seems like a simple task but is was really frustrating. Now that we successfully tattooed this little buck we were able to separate him from his Momma and sisters. We have several rabbits that are for sale and whenever I worry about running out of cages, buyers show up, so I am patiently waiting for that to happen again. 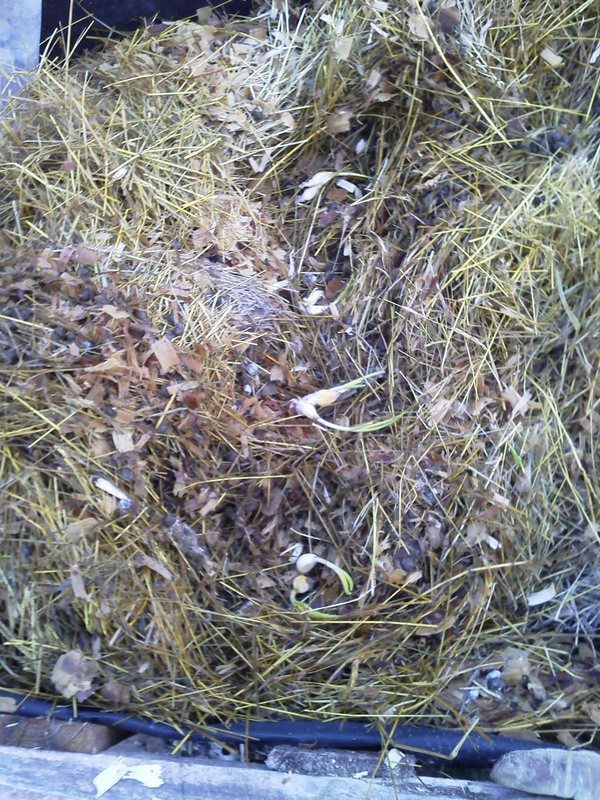 Today is the shortest day of the year, winter solstice, time to plant garlic. I keep garlic cloves in my refrigerator, I know that they will last in the pantry as well, but in the refrigerator they last for a year or more. These are cloves are from 2013 so I am really hoping they grow well, they had started to sprout in the frig. I planted them in a deep bed of straw and rabbit manure. I hope this will give them the protection they need from the hard freezes but still allow them to grow large bulbs. We are continuing to work like elves on our homemade Christmas gifts. Our family is really simplifying our Christmas traditions and the one thing that we all agreed on, is that we do not need as many gifts. My kids are truly amazing, but that is a book for a different day. Anyway, we decided to have two gifts, one store bought and one homemade. 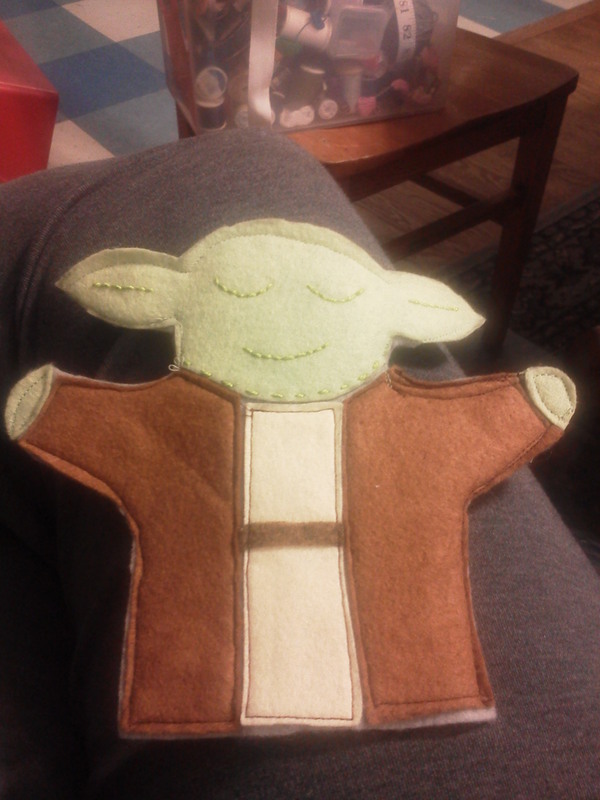 All of the gifts I am giving this year are sewn. 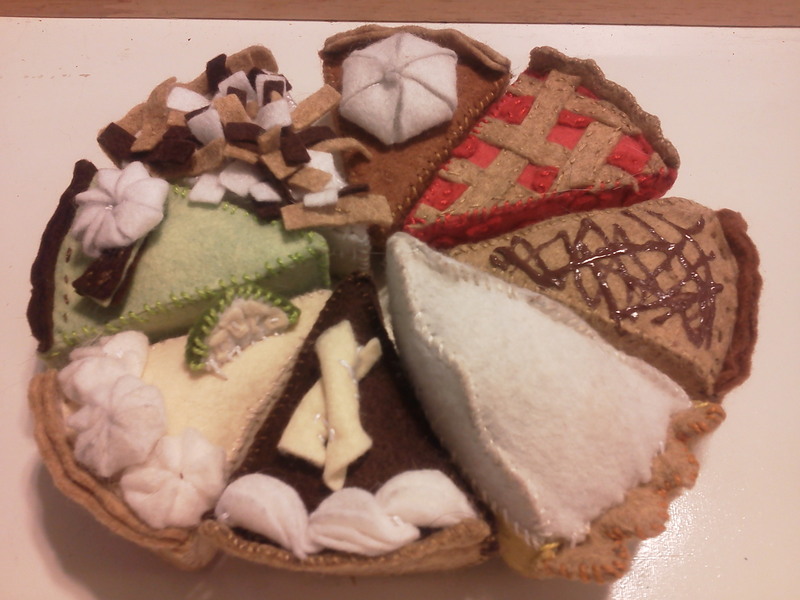 Below there are pictures of one of the puppets I am making for my son and the felt pretend pie I made for my daughter. I hope they enjoy them. I am unable to post what I am making for my husband because he occasionally reads my blog and I do not want to give it away. On a sad note we lost another chicken to a hawk. 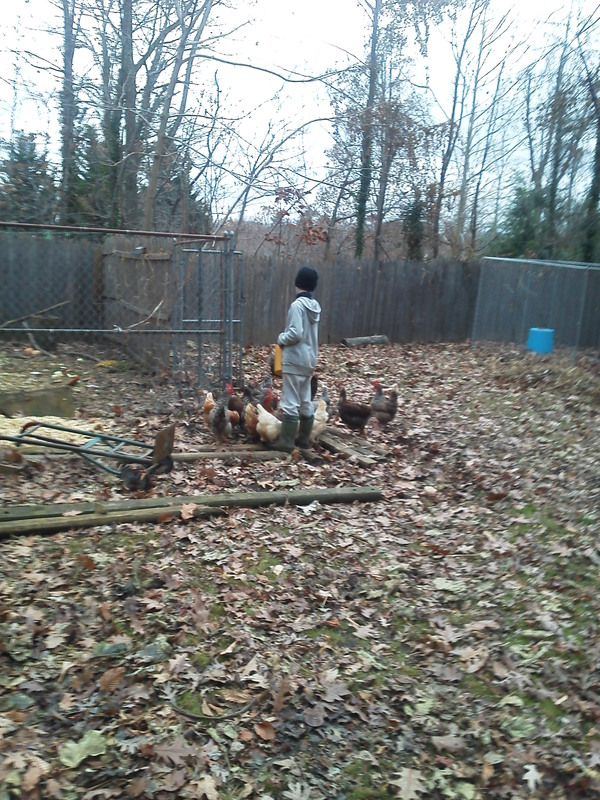 We are hoping that early in Spring when the ground thaws we will build a new chicken yard. We need one that has wire on the top, we found bird netting is horrible to work with. We would like to have a chicken yard and rabbit grow out pen together. I have heard that the rabbits and the chickens enjoy each others company. When the rabbits where in with the chickens in the past we did have larger litters, we will have to see if there is truly any connection between the two. On a happy note, we are looking for some land to rent so that next year we can not only grow more of our food, but also food for our friends that really would like more of our veggies. A couple of CSA families is my dream for the future. I would like to eventually have a larger property and support my love of farming with a handful of CSA subscriptions. That is all for now. Merry Christmas to you all from Our Family to Yours. I know that this is not homesteading or home making related but it is something that is effecting my family greatly right now and I wanted to share it with you. I am still struggling with my Lyme Disease. Earlier in November the same bulls eye rash that I had on my leg a year and a half ago came back. It was in almost the same spot and it looked just like it did before. I am lucky enough to have a Lyme Disease Specialist and he started me on another round of antibiotics. Today I took my last pill and to be completely honest with you I do not feel any better. I wrote a journal of the last couple of weeks and I wanted to share it with you, just in case one of you is struggling with Lyme Disease and needed to know you were not alone. This is my second full day on the antibiotics. The last two nights I have slept at least 8 hours and I wake up still wanting to sleep some more. I have even wanted to take a nap in the afternoon. On Wednesday I fell asleep on the couch at 730. My body is obviously fighting something. The other major thing that I have noticed is my hands feel stiff and weak. I am not able to open lids, write for a long time or type. I have also been dropping things when I am doing dishes or folding laundry. My legs are also stiff and weaker and I notice it when I am walking up the stairs. My headaches are mild, but present. I am able to function and have been drinking close to a gallon of water. I have not been taking any Tylenol. The mark on my leg is still there, but not as bright. I have tried to take pictures but it is not bright enough to show up with my phone camera. I can still see the halo and the skin is wrinkled or scar like in that area. The rash is completely gone. Now my symptoms are starting to get much much worse. Typing is painful. My hands and joints hurt. I have weakness all over and it is even hard for me to write. It even hurts for someone to touch me. The kids want to sit on my lap and it is just too painful. I had a low grade fever last night of 99.9. The medication has taken away my appetite and I really only eat when I have to take the medication. My stomach does not feel that great, almost like a sea sickness. Today I am going to take some Tylenol to try and help the pain, especially in my hands. The medication is really bothering my stomach. I started eating two bowls of yogurt a day when I take my medication, as well as, taking an additional probiotic. This has really helped and I think I am going to continue to do this as long as I am on the medication. Yesterday I baked pies all day for Thanksgiving, I peeled, sliced, mixed and rolled out pies. My hands are so sore! I was able to take Tylenol to help me get through the day, but today was really bad. The tylenol did not help at all. I am very tired and have to sit down more than normal. I am glad my family helped me cook some of the meal. I crocheted my daughter slippers for her birthday. My hands are so frustrating. Crocheting hurts. This project normally would have taken me a couple of hours took me 2 weeks. I had to stop and start every couple of rows. My greatest challenge is still having no energy and my hands hurt. Even typing has become something that is uncomfortable. My right hand seems to be much worse than my left. I wonder if that is because I use it so much more. Secondly, I just have no motivation or energy. I have to force my self to get up and get moving and I can fall asleep sitting at a table. Today I took my last medication. I was hoping that I would being feeling better, but honestly there are days it feels worse.